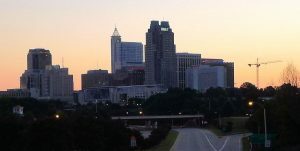 With all the new restaurants opening up in downtown Raleigh, it’s sometimes hard for me to get outside the beltline so I was glad to get an email for the newly opened Seasons 52 over in Crabtree Valley Mall. I’m not familiar with this upscale chain of restaurants but apparently Raleigh is their first location in the state of North Carolina. 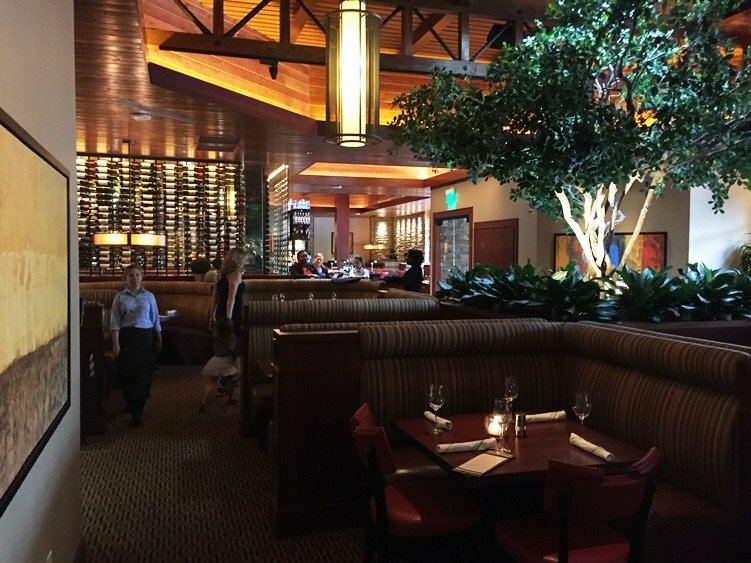 A quick scan of their Yelp reviews and I can tell the restaurant is pretty solid so I set up a dinner visit to see and experience what Seasons 52 is doing for food and wine in the area! The first challenge is finding Seasons 52 given how big Crabtree Valley Mall is. Thankfully it’s in the front strip of restaurants at the mall, having replaced a Starbucks and several other store fronts to the right of the upper mall entrance. 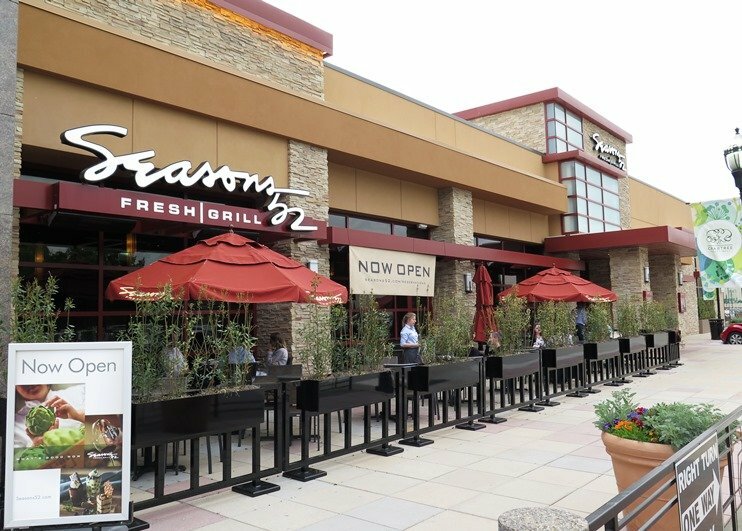 Seasons 52 sports a lovely patio up front with planters, along with a crimson awning and umbrellas. Up front I meet restaurant manager, Camie. 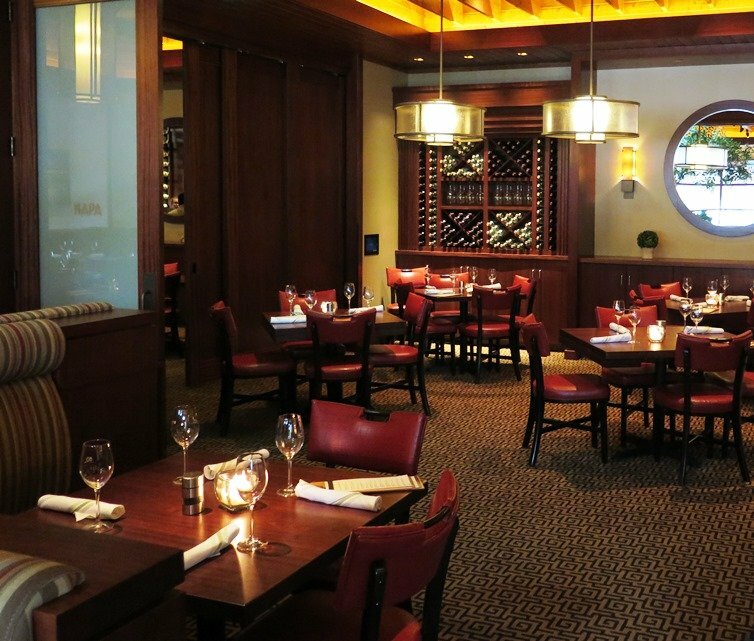 She walks us through Seasons 52 large space and around the private room. It’s a good looking spot full of warm woods, leather and natural lighting. 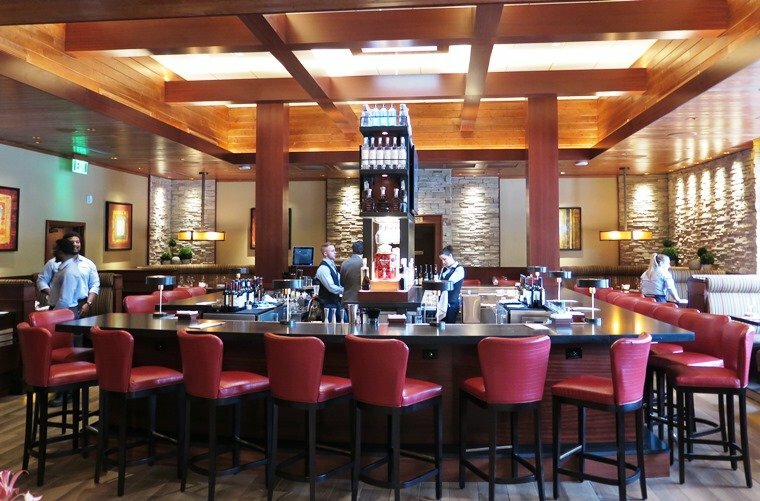 It feels like an upscale steakhouse, without the darkness. Very similar to spots I ran into when visiting Napa and Sonoma Valley. But of course the floor to ceiling, centerpiece wine display behind the hostess desk gives a hint as to what Seasons 52 is focused on. We’re seated at a booth by the busy bar and I’m admiring the layered stonework on the walls, a very elegant but organic touch. 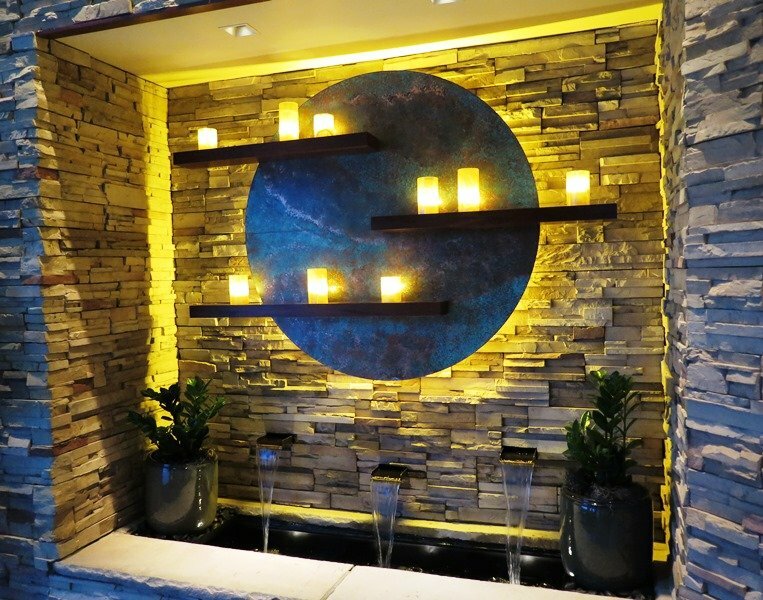 I would describe the overall decor at Seasons 52 as California style, sophisticated and warm. And given their focus on grilled local ingredients and wine, it fits in nicely with that motif! As you can guess, Seasons 52 has a nice wine list by the bottle and/or glass along with a decent selection of cocktails. 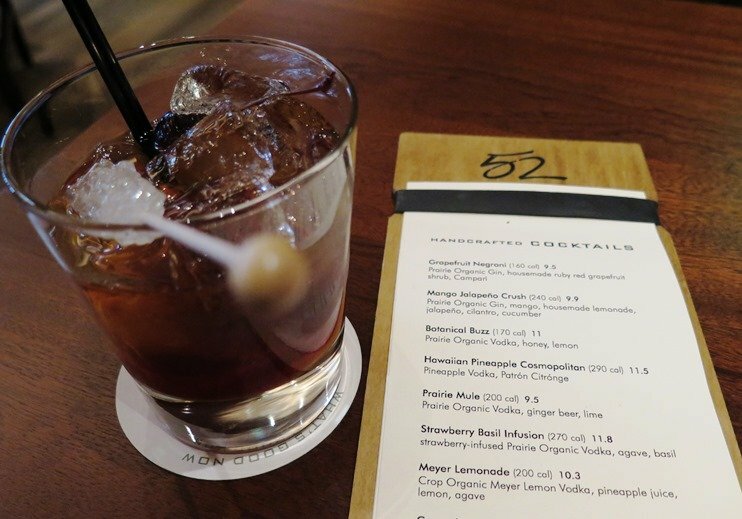 I go with the prosecco while my friend dives in on a New Fashioned, Seasons 52’s spin on a classic. 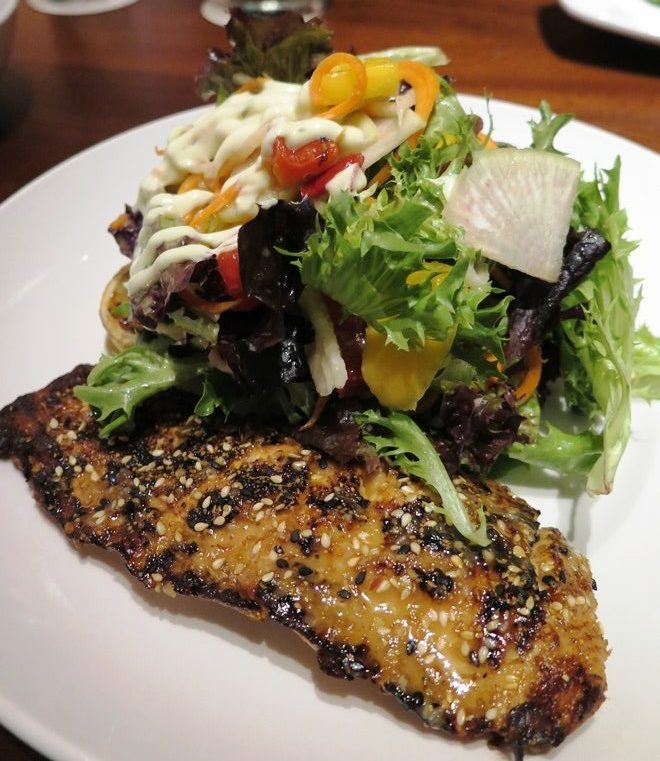 The menu at Seasons 52 is pretty basic with a focus on flatbreads, salads and grilled meats-fish. There’s a strong seasonal bent to the menu and they try to source local ingredients as much as possible so the menu will change up frequently. And the seafood is all procured in a sustainable fashion. While we’re trying to decide, Camie the restaurant manager offers to do a chef’s choice dinner which works for me! Appetizers here are in the $8 to $12 range with entrees from $20 to $32 so we’re talking about a more upscale menu. Note that they also do a happy hour special from 4 to 6:30pm, Monday to Thursday when you can enjoy $5 small plates (Sunset at Seasons menu). 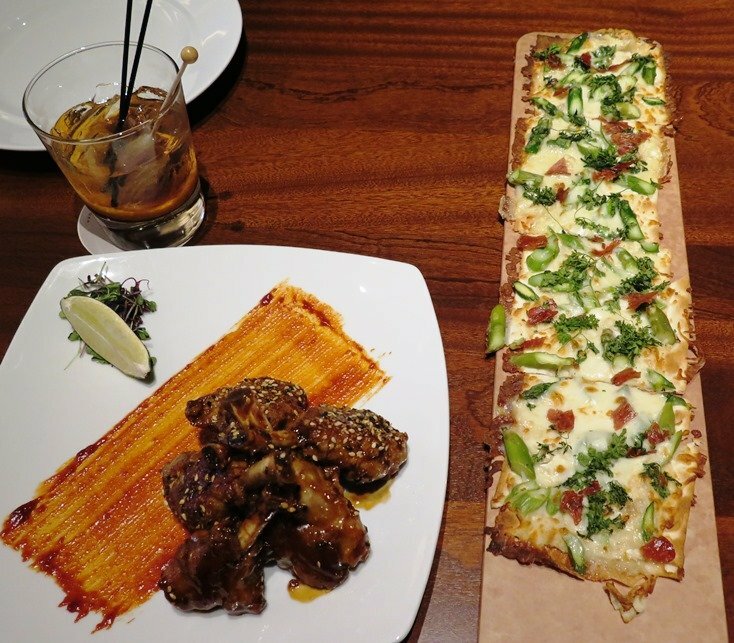 The starters show up and we’ve got two lovely plates, the duck wing lollipops and prosciutto-asparagus flatbread. The duck wing lollipops are drums with the meat pulled up and grilled at the top. The slightly spicy gochujang sauce is a wonderful foil for the rich duck meat, a great appetizer! And the flatbread is wonderful, too. Tender asparagus pieces paired with salty bits of prosciutto and camembert cheese! I like how the flatbread and cheese is seared nicely to create crispy edges. The tuna tartare appetizer shows up next, a stacked trio of tuna, fruit and avocado and it’s served with some beautiful Hawaiian sea salt crisps. 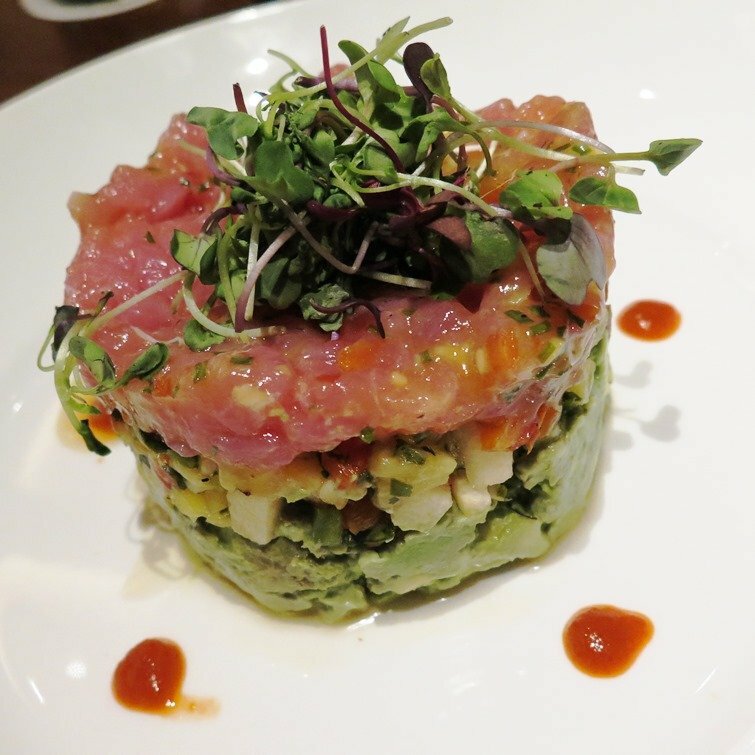 It’s a great combination of flavors here: the soft tuna, citrus-mango and luscious avocado. An excellent and substantial appetizer perfect for sharing and very nicely presented. 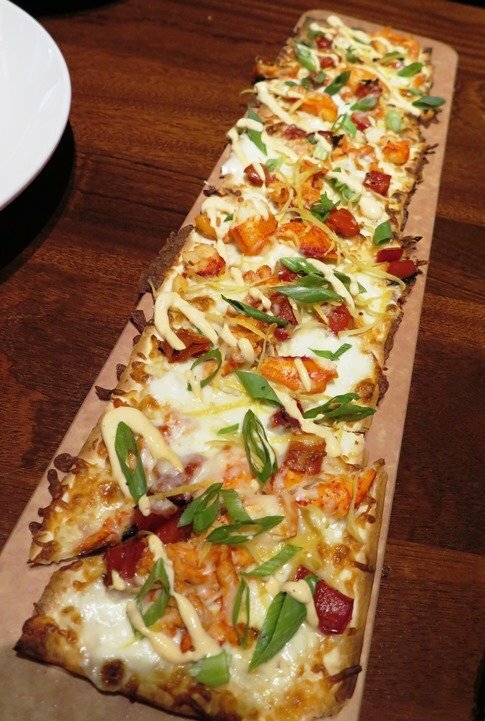 The final appetizer brought to the table is Season 52’s lobster mozzarella flatbread which has a generous amount of lobster, peppers and scallion. A fun way to try out this tasty crustacean. For dinner, we’re going surf and turf with Season 52’s NY strip steak paired with seared scallops AND a grilled salmon salad for good measure. 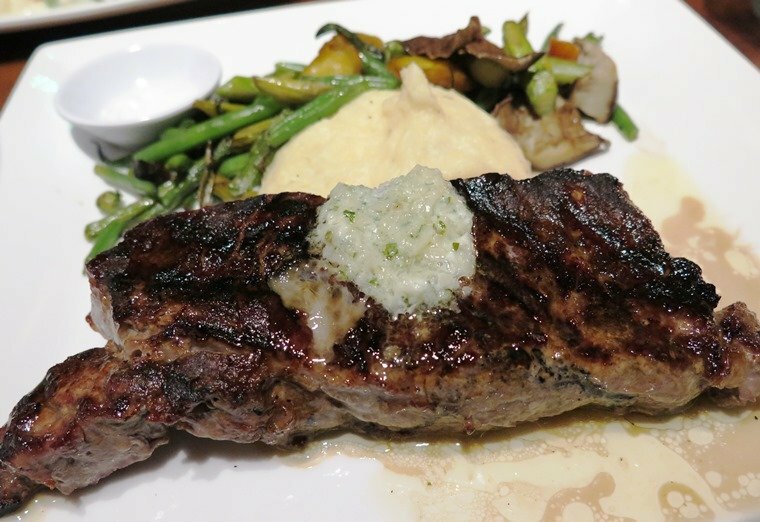 The steak is a beautifully seared piece of beef with a bit of compound butter melting atop. Paired with some creamy mashed potatoes and a spring mix of sauteed veggies makes for a more healthy, meat and potatoes entree. Note that Seasons 52 gives their diners calorie counts for all the menu items which is a nice touch, especially if you’re trying to eat more cleanly. 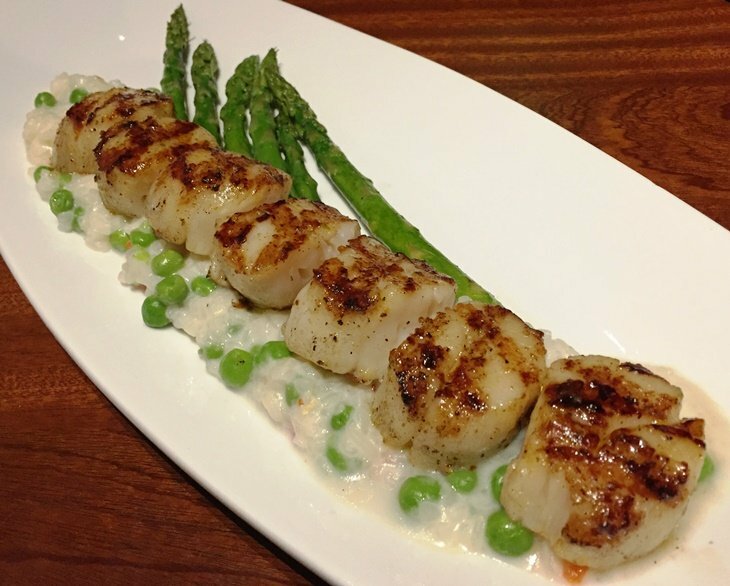 The seared scallops are served on a green pea risotto with asparagus. 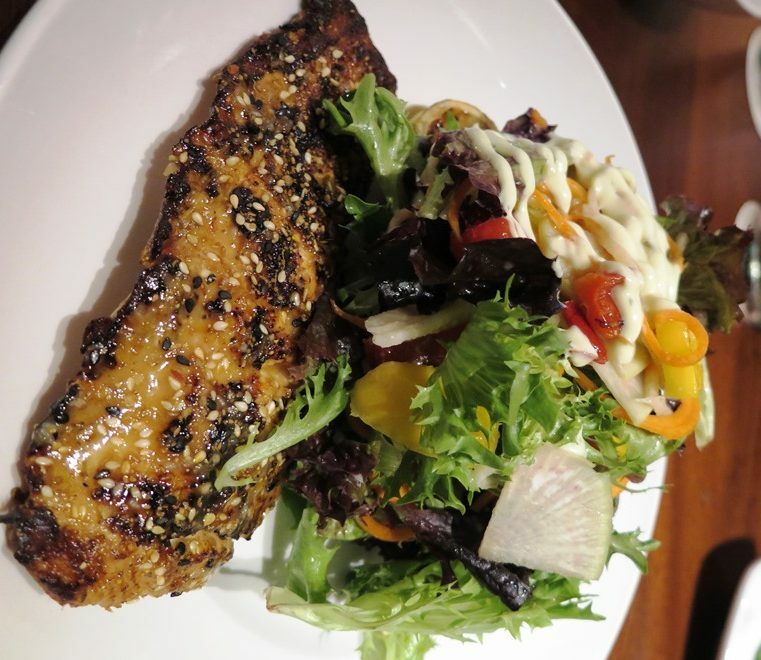 As you can tell, Seasons 52 is big on fresh vegetables for their meals paired with a healthy, grilled protein which is a far cry from what you’d get at say, the Cheesecake Factory, next door. The grilled salmon salad is beautifully presented with a lush mesclun salad and toasted sesame dressing but we’re pretty much ready to tap out at this point in the meal. 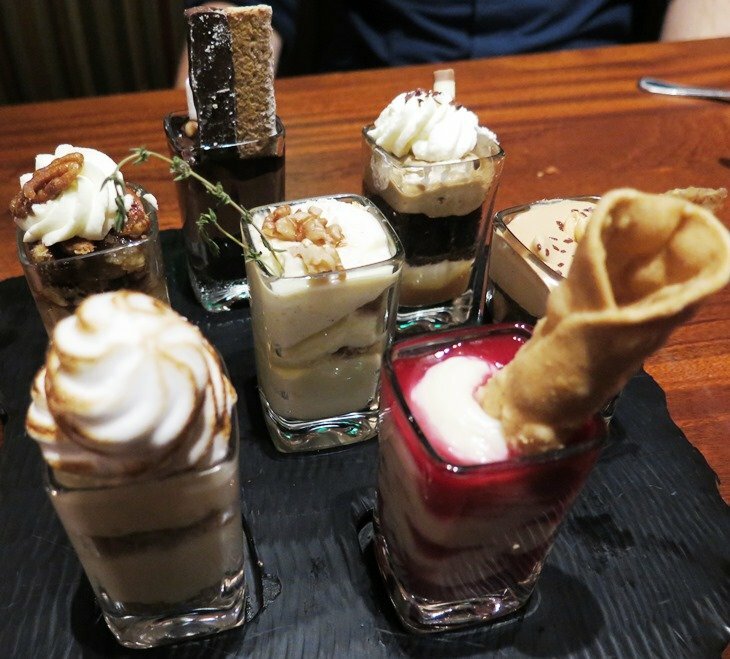 Thankfully Seasons 52 serves up a “Small Indulgence” type dessert, individually portioned sweets to finish up dinner. Offered in a variety of flavors (strawberry cannoli, smores, peanut butter chocolate and more), they make for a perfect treat to manage your sweet tooth at the end of the meal. So great meal, Seasons 52! 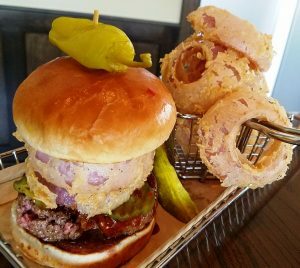 What they’re trying to do here is a bit different than what you’d find in many restaurants that are focused on high calorie, rich fare. 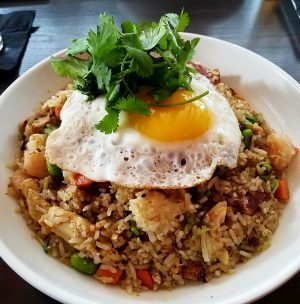 The food here at Seasons 52 strikes a good balance between delicious and healthy and offers it up in the richness of its upscale dining room. I suspect the diner demographic here would be a bit older and fits in nicely for the crowd in the Crabtree Valley Mall-N. Raleigh area. And it’s much appreciated because sometimes it’s better to eat delicious and healthy rather than killing it on the calories, bon appetit!